Ask any couple that has been together for a while, and they will tell you that one of the secrets is their ability to communicate. And for each couple, communications will work in many different ways. Have you ever seen some couples who seem like they are arguing, but in reality are speaking directly? There is a huge difference, even though it’s a very fine line. 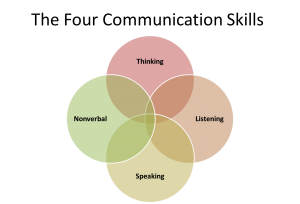 This type of communication may work well for some personality types, but not for others. Some couples remain silent when dealing with turmoil. Although it is true that sometimes it’s better to let the dust settle on a potential argument rather than face the problem when emotions are heated, the reality is that “Silence is NOT Golden” when it comes to conflict resolution. In fact, the silent treatment can break down a relationship faster than anger, which if used constructively will bring about positive change. Other couples air their differences out in public. Not a good idea, as it is not only uncomfortable to others, but often forces people to take sides and the focus of the original disagreement is lost. Let’s look at origins of the word “Communicate.” The Latin word “Communis” means “Common.” The Ancient Greek term “Com” means “With.” “Communicare” in French means “To Share.” In other words, when you communicate with anyone, the goal is to be with and share, or to find things in common. The next time you have a disagreement with anyone, remember that what is most important is to openly listen to what the person is trying to say, watch the body language, think about what has not been said, and carefully share your thoughts in a considerate reply. Sticks and stones will break your bones, but poorly chosen words can elevate a misunderstanding to the point of irrationality too. The goal is to find common ground, not to draw lines in the sand.